After the ABC’s screening of ‘Roller Derby Dolls’ the topic of roller derby just wouldn’t drop. After several months of complaining about the lack of RD in Wollongong I decided to make it happen. 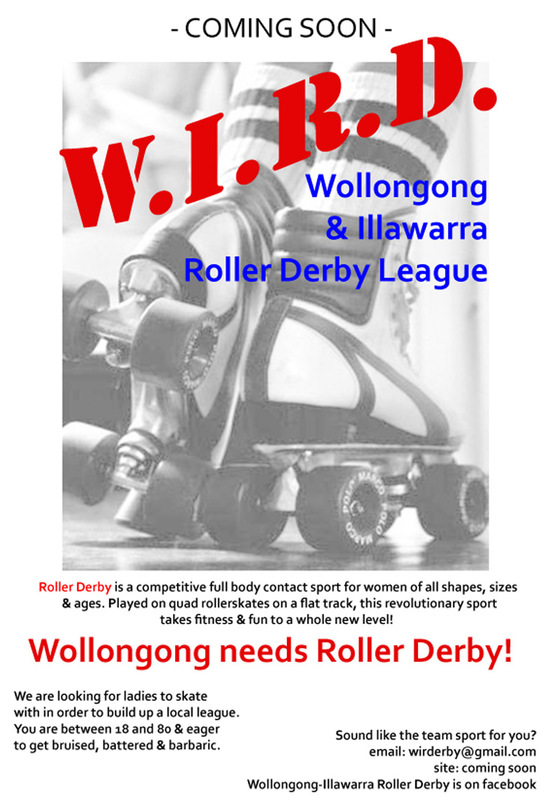 Researched RD on the net and started the Wollongong-Illawarra Roller Derby facebook group in late December, 2008. By 25 January we have 72 members, including regional derby girls, international derby girls and a strong core group of locals. A meat and greet is organised for January 25 and I started organising enough information to run a (hopefully) productive meeting. Posters (A4 – photoshop – printed at home) go up on January 3 in several venues around Wollongong. Have info for 1st meeting. I started collecting information from other derby groups including Sydney (SRDL), Ballarat (BRDL) and Newcastle (NRDL). All the women I approached were incredibly helpful and I received sample constitutions, dvds of training and great info sheets on everything from ‘what to expect in your first year of derby’ (NRDL) to ‘how to deal with stinky pads’ (SRDL). Before our group is even one month old we’ve been completely embraced by the NSW roller derby community. WIRD has been invited to an upcoming scrimmage in Sydney, offered help with training and info on the best local places to buy equipment. I rock up for our first meat and greet with a folder full of info, some dodgied up fliers and my happy loud voice on.